Spa Crest Europe is gearing up for a ‘Tuff performance’ during the 19th edition of SPATEX that will include a dedicated Spa Day when the wet leisure showcase returns to Coventry. 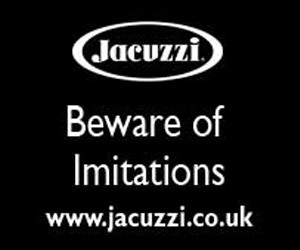 The loyal SPATEX exhibitor and European importer and distributor for Spa Crest, the world’s only carbon-fibre reinforced hot tubs, will be utilising the three-day trade exhibition at the Ricoh Arena, running from February 1 to 3, to promote its enhanced offerings from the USA manufacturer, which is the producer of the WhatSpa? Best Buy Award-winning seven-seater Vision Pisces that comes in at 210 x 210 x 94cm; and its Brand2Go bespoke dealership initiative. Members of the Spa Crest Europe team will also be highlighting a new agreement with Arizona-based Tuff Spas to import their high-quality range of ‘plug n play’ roto-moulded hot tubs that are synonymous with extreme durability and unique integrated cover lifters. It is a joint initiative with Gatwick-based Waterstream Group, which currently retails Spa Crest models as well as the Villeroy & Boch range of Wellness at Home hot tubs. It gives both organisations exclusive rights to sell the Tuff Spas models to the British trade. Their innovative designs and extreme durability are well known in the USA market, but Tuff Spas now have a dedicated distributor to increase awareness for their product in the UK. Spa Crest Europe Managing Director Tony Welsby revealed that he is delighted to have secured distribution for the brand after scouring the market for a suitable roto-moulded range. 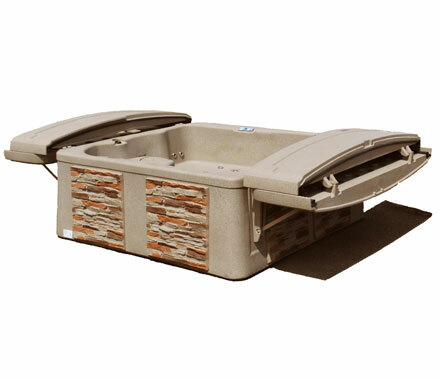 As well as being extremely light-weight one-piece spas, cast in an advanced polymer, Tuff Spas are best known in the USA for their unique integrated cover lifters in the Tuff Top Series of models, including the two-seater TT150, four-seater TT250 and TT650, pictured, for five to six people. Produced out of the same material as the spa shell, the exclusive design of the poly-ethylene cover transforms into convenient spa-side bars when the cover is removed for use. These innovative maintenance-free covers, which are designed to allow one person to easily open and close them; also have a peace-of-mind lifetime warranty and are designed to never be replaced and hold over 300 pounds in weight. The ‘plug-and-play’ format of Tuff Spas ensures simple set up with a cord that can be plugged into a 13A socket to power the advanced Gecko controls, which have been designed with two large access panels on all four sides for easy accessibility to the equipment. Choices of models are available in the TT Series and TS Series; which includes the two-seater TS150, round TS350 for three to five adults, and TS550 for six to eight adults with unique integrated steps design. “We’re absolutely deslighted to be distributing Tuff Spas in the UK,” said Tony; “We’ve long had a great product range catering for most budgets, price points and features, but we’d been lacking an offering in the important roto-moulded market sector. During SPATEX, Tony and his team will also be spearheading the promotion of the enhancements to the carbon-fibre reinforced Hampton, Hatteras and St Augustine in the Spa Crest Coastal mid-range of hot tub options, which includes the WhatSpa? Best Buy Award-winning Charleston that has a lounger within its provision for six people and comes in at 210 x 210 x 86cm. Tony and the Spa Crest Europe team will be available to discuss the dealer opportunities for the Spa Crest, Coastal, Vision, and Brand2Go ranges, plus the new Tuff Spas retailing availability at SPATEX from February 1 to 3 on Stand D51 in the Jaguar Exhibition Hall. SPATEX opening times are 9:30am to 5pm on February 1 and 2. The third day, February 3, is open from 9:30am to 4pm; and will be including the first ever dedicated ‘Spa Day’ organised with the help of ISPE. Filed Under: Event news, Events & expos, News, News & views Tagged With: Brand2Go, hot tub retailers, Spa Crest Europe, SPATEX, Tuff Spas, Villeroy & Boch, Waterstream Group, WhatSpa?